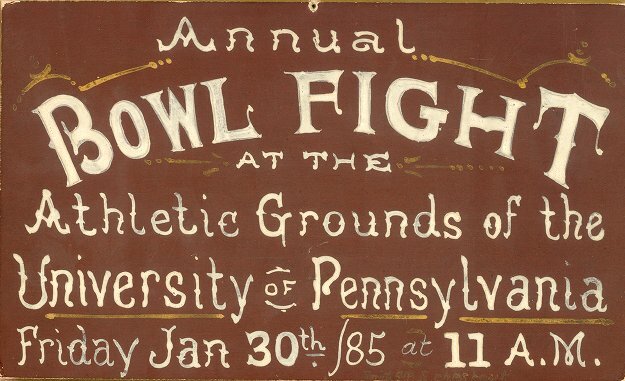 The rules governing the bowl fight were basically very simple. The Sophomores provided the bowl and the freshmen provided the bowl man. 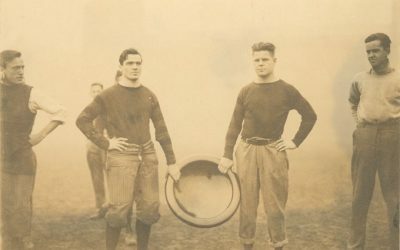 The Bowl man was originally supposed to be the third honor freshman. However, when the custom of awarding honors was abolished in 1891 the bowl man was elected from then on. And the basic rule was that the freshmen would win if they were able to break the bowl and the sophomores would win if they were able to place the bowl man into the bowl. From year to year, however, refinements were necessary, leading to considerable change in the rules over time. It was an unwritten rule that no implements of any kind could be used and no fist-fighting was allowed. Also, as the bowl became very thick and almost unbreakable in the later years and when the custom of having two halves was established, it was agreed that possession of the bowl was enough to qualify the freshmen victorious. Thus, all that the freshmen had to do now was to have more hands on the bowl than did the sophomores at the end of the fight. 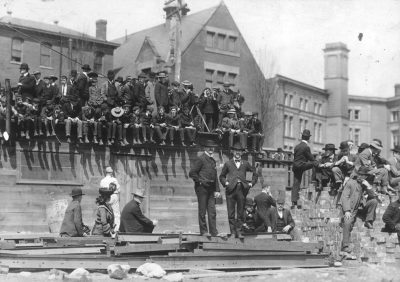 In 1885 the fight was shifted to the athletic fields at 36th Spruce. 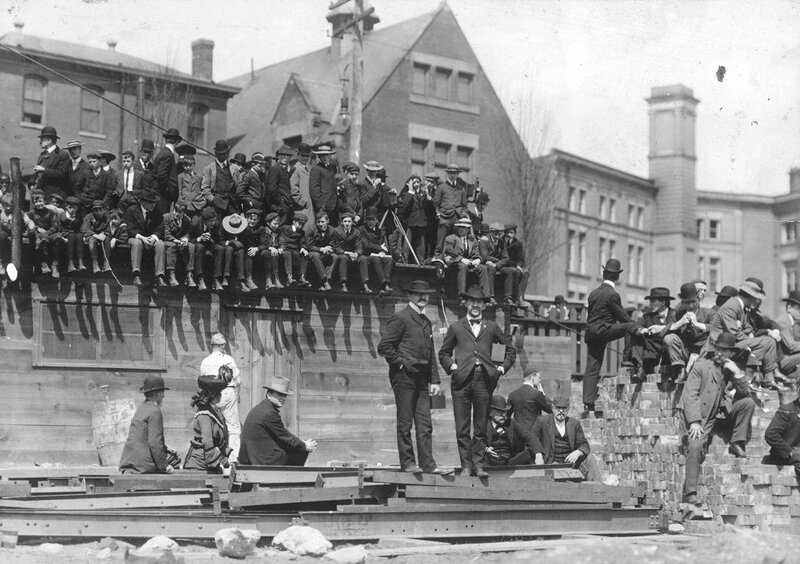 New rules adopted a year earlier were used to fix boundaries and a time limit for the bowl man’s escape. These rules, however, were soon viewed as too suffocating. 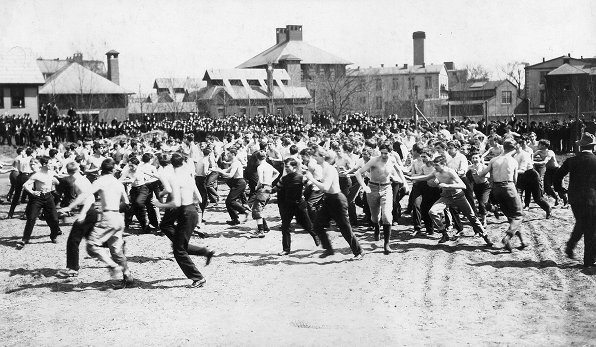 In 1888 the fight occurred around College Hall – without the rules. 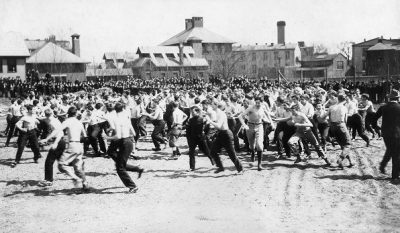 In 1893 there were again suggestions to standardize the rules of the bowl fight in order to tame the fight and also to avoid the customary draw. Only some of the suggested rules were implemented. It was agreed to have the fight on the Athletic Fields and to divide the fight into two periods. The first half was the fight for the bowl man. In a fifteen minute period, the sophomores attempted to bowl the bowl man while the freshman attempted to get him out of the fields. If both classes failed to accomplish these goals, the bowl man was released and the first half was declared a draw. In the second half, the fight was for possession of the bowl. The freshmen won if they broke the bowl, otherwise the half was declared a draw. In 1896 the halves were reduced to ten minutes each. It was also decided that the bowl man could not attempt to escape until the two classes had started to tussle with each other. In 1898 the separate halves were replaced by one twenty-minute fight. It was also agreed that, until he was tackled, the bowl man could escape only from the fence behind the sophomore ranks. In 1899 it was again decided to follow a system of having two halves and a new rule of awarding points. The first round was the fight for the bowl man and the second round was the fight for the bowl. Five points went to the freshmen if they got the bowl man unbowled and five points were awarded to the sophomores if they could bowl the bowl man in the first round; in the second round additional points went to each side for the number of hands that team had on the bowl. In the second round, the bowl would be placed midway between the two warring bodies and a rush would be made for it at the official’s signal. In 1900 it was decided to have two twenty-minutes halves with an intermission of ten minutes. Most of the other rules were quite similar except that the rule of awarding points was completely dropped. In 1901, the intermission was reduced to five minutes. It was ruled that the bowl man could escape only from the side directly behind the position of the sophomore ranks. In 1903 the time of a single half was again set to ten minutes. Possession of the bowl in the second half was decided by the number of hands on the bowl rather than by absolute possession. Thus a system of counting points only in the second half was agreed upon. Other rules however remained the same. 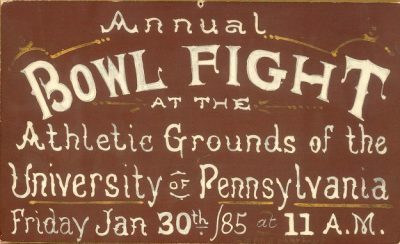 In December 1906, it was decided to hold the fight at the Franklin Field and to increase the time of the intermission to ten minutes. All the remaining rules were the same for this year and also for later years. No significant rule changes were made after this year.